Bordeaux Under One Roof, an event sponsored by http://www.bordeaux.com, is a public walk around tasting of white and red wines only from the Bordeaux region of France. 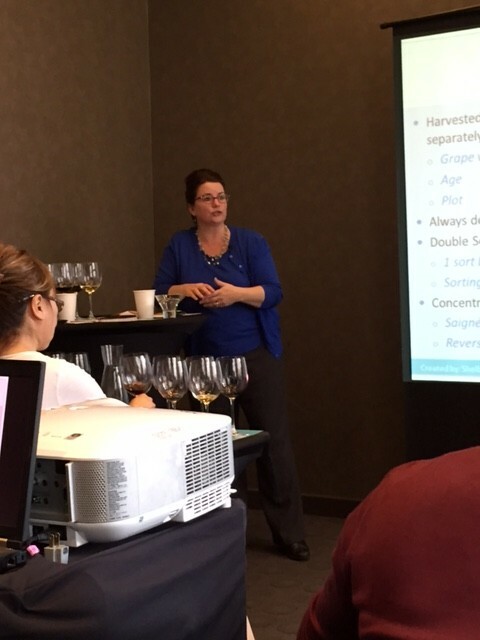 This year I was able to attend a short lecture and tasting that I thought wine 101ers could learn from as well. 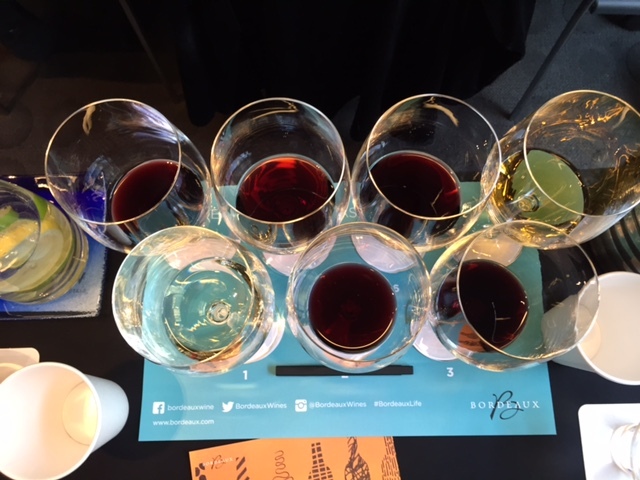 Climate, soil, geographic regions – all of these factors dictate the wine style in Bordeaux, France – and Ledgerwood’s class would cover a lot of this for us. A new marketing campaign, Discover Bordeaux, is using this new slogan to get wine drinkers’ attention in their description of Bordeaux: Authenticity, Innovation and Diversity. France is about the same size as Texas. The Aquitaine Department of the Atlantic Ocean allows for extensive waterways in the Bordeaux region. Bordeaux is at the convergence of two major rivers. Key grapes in Bordeaux region are named after the place they come from – not the way we do it in the U.S.
Two mountain chains in Bordeaux provide snow that turns into water in the vineyards. More warmth and water occurs in the fall and time of harvest. This is important for Botrytis Cinera, aka Noble Rot, where water literally is sucked out of certain grapes (The white wine Sauterne from Bordeaux get their sweetness this way) and the skins remains intact. There are approximately 60 different appellations currently in Bordeaux. There are 6,800 different growers, compared to 400 in Napa Valley and 3,000 in California. Overall this produces about 60 million cases of Bordeaux wine annually. About 300 merchants export to 170 countries, with U.S. as the 4th export market in terms of dollars. The “Carmenet Family” is the traditional term used to encompass all the Bordeaux grapes. The majority of Bordeaux production is red wine. Semillon is produced more than Sauvignon Blanc or Muscadelle. Most producers create a blend as each grape contributes something, which in essence creates a higher quality wine. Using the word “Chateau” on the label means a winemaking cellar is on the property. The tropical sea, many eons ago, set a limestone crust in the area. In the right bank it moved up, and in the left bank it moved down. Then came the ice ages, and as the ice melted and receded it left behind water and massive rivers, cutting through that limestone and bringing in different types if soils. Note: 24 seats were not enough for all of the attendees. An extra 10 chairs were brought in, and with some others standing, there was not enough wine for the room to sample. So I had fun passing my glass behind me for a pal and others to taste and/or just smell as the lesson went on. But the dude next to me, that complained of my perfume when I fanned myself – I could do without. I don’t wear perfume to tastings. Chalk it up to deodorant (he could have benefited from) or hair spray. I told him I wasn’t wearing perfume, he gave me a look and I stopped fanning out of simple courtesy. And I didn’t complain as he reached over me repeatedly to take photos of the slides with his cell phone. In the words of Nicole Kidman in “Bewitched”, JERK. And, when I thought that was it, he drank my water glass! I’d like to send him my short Wine Etiquette book! I hope to never see HIM again! Green apples, white pepper, Meyer lemon; same aromas carried through on palate. Juicy red fruit, leather, nice balance; red fruit, peppery, low tannin, good to drink now. Jammy red to black fruit, green peppercorns, milk chocolate, mint; well done, a bit of spice and tannins to pair with the lovely dark fruit, pepper, long finish. Mushroom, dark plums, blueberry, bark; Dry, redder berries on the palate, a lightly smoky finish. Balanced fruit and spice, smooth, blackberry; same lovely balance of fruit, spice and tannin. Well done. Milky chocolate, black fruit bowl, forest floor; light tannins and spice, red to blue fruits. Lemon drop Martini, pear, wet pebbles; chewy viscosity, a tiny bit of acid, golden peaches and sweet pears.